1. Popcorn is a type of maize, a member of the grass family, and is scientifically known as Zea mays everta. 2. Americans consume some 16 billion quarts of this whole grain, good-for-you treat per year. That’s 51 quarts per man, woman, and child. 3. Compared to most snack foods, popcorn is low in calories. Air-popped corn has only 31 calories per cup. Oil-popped is only 55 per cup. 4. 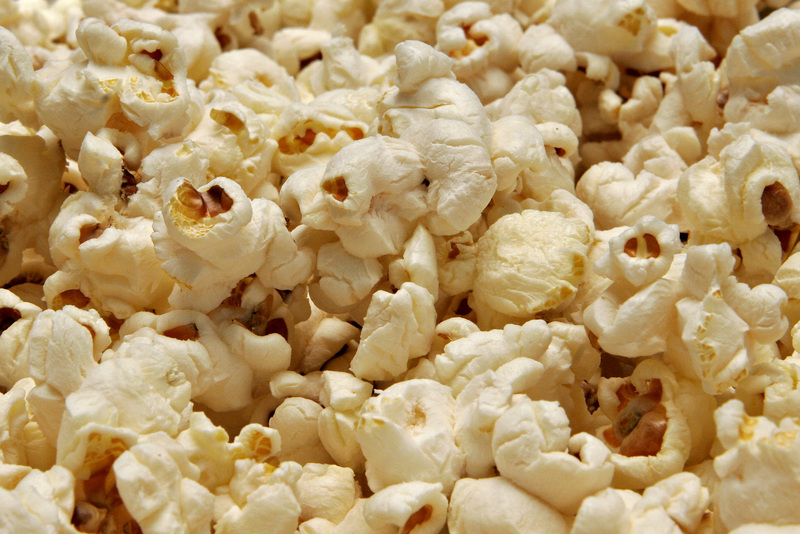 Popcorn has more protein, phosphorus and iron than potato chips, an ice cream cone, pretzels or soda crackers. 5. Of the 6 types of maize/corn—pod, sweet, flour, dent, flint, and popcorn, only popcorn pops. 6. Popcorn is a whole grain. It is made up of three components: the germ, endosperm, and pericarp (also know as the hull). 7. A microwave popcorn popper is the best way to go if you’re watching your calories because of using no grease. 8. A popcorn kernal needs between 13.5-14% moisture to pop. 9. Popcorn differs from other types of maize/corn in that is has a thicker pericarp/hull. The hull allows pressure from the heated water inside the kernel to build, eventually bursting open. The inside starch becomes gelatinous while being heated. When the hull bursts, the gelatinized starch spills out and cools, giving it its familiar popcorn shape. 10. Most U.S. popcorn is grown in Indiana, Nebraska, Ohio, Illinois, Iowa, Kentucky and Missouri. 11. The peak period for popcorn sales for home consumption is in the fall. 12. Most popcorn comes in two basic shapes when it’s popped: snowflake and mushroom. Snowflake is used in movie theaters and ballparks because it looks and pops bigger. Mushroom is used for candy confections because it doesn’t crumble. 13. Popping popcorn is one of the number one uses for microwave ovens. Most microwave ovens have a “popcorn” control button. 14. “Popability” is popcorn lingo that refers to the percentage of kernels that pop. 15. There is no such thing as “hull-less” popcorn. All popcorn needs a hull in order to pop. Some varieties of popcorn have been bred so the hull shatters upon popping, making it appear to be hull-less. 16. How high can popcorn kernels pop? Up to 3 feet in the air. 17. The world’s largest popcorn ball was created by volunteers in Sac City, Iowa in February, 2009. It weighed 5,000 lbs., stood over 8 ft. tall, and measured 28.8 ft. in circumference. 18. If you made a trail of popcorn from New York City to Los Angeles, you would need more than 352,028,160 popped kernels!